Bhature / Bhatura is classic Indian puffed bread which is traditionally served with Chole Masala. 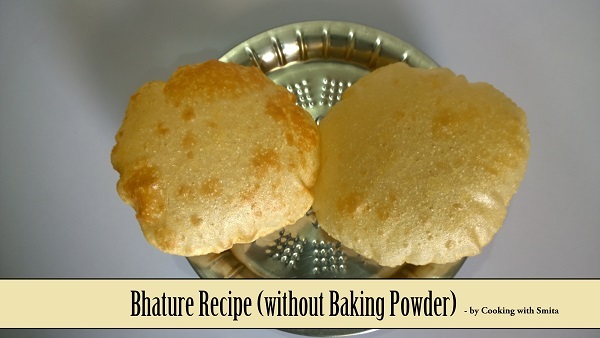 Here I am sharing a recipe of Bhature without Baking Powder. Watch step by step guide on how to make Bhature and serve with one of the favourite dish Chole Bhature. Take a large bowl; add All Purpose Flour, Wheat Flour, Semolina, Salt, Curd and Grated Potatoes. Add water little by little and prepare the dough. Add some Oil, knead well. Cover with a wet cotton cloth and let it rest for 10 minutes. After 10 minutes, knead again and make medium size balls from the dough. Heat oil in a kadhai over medium flame. Apply some oil on dough balls and roll them. Deep fry one at a time and press gently while frying. Serve hot with Chhole Masala. Thanks for sharing this awesome recipe…………….